Outlook PST Split Tool is a sophisticated program to download for Outlook users using PST format to get safe and easy division of big PST files into smaller sizes. Split any size of PST files both Unicode and ANSI. Quality of PST files are intact, no data loss is occurred. 3 options to divide PST files- year, size and folder. Capable to split archives PST files as well as all items stored in PST. Corrupted PST files need to fix before division. MS Outlook is install during division of big sized PST files. Compatible to MS Outlook 2003, 2007, 2010 and 2013. The tool is designed to break big-sized PST files or folders without any complication. It is required to split either PST with Unicode or ANSI, easy split of Outlook files are performed by the tool, keeping Meta properties, content and structure of the data intact. Choose your way to break PST files. 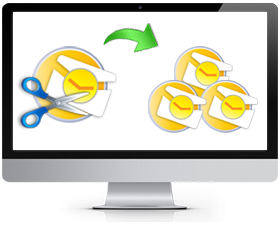 The tool provides you three different ways to split Outlook PST file: • Split by Size • Split by Folder • Split by Year. You can to split large Outlook data files according to year the task as the app breaks PST files by year. It splits a PST folder into multiple parts according to the selected year for example, 2010 to 2014 split PST files means you will have 5 files according to year. Outlook PST Splitter gives users the facility to divide archive/PST Outlook files or folders as per folder. The option allows users to divide large PST files into smaller files for according to its folder. Outlook PST Splitter performs file division as per the size you have decided for a file. Selecting this option will let you split large Outlook PST file and you can select any range to divide it accordingly. Save PST files after splitting to your desired location. The application allows users to create a new PST file to save the split data in the folder. When all the selected PST files or folders are divided, Outlook PST Splitter creates a log report or comparison report as CSV which includes folder path, folder name etc… to gives users the space of comparison of quality of files. Try Split PST Pro demo version which is available for all people who are interested or intended to buy the product. Try the demo version to know the features of the app closely and examine them freely. Can we install split PST on windows OS (8 and 8.1)? Yes, you can install split PST on all the versions of Microsoft Windows (8 and 8.1). Can I split a corrupted PST file by using this tool? Split PST software split only healthy files. If you want to split corrupt or damage PST file, you have to first recovered it into healthy from our outlook recovery software then you will be able to split. Is it necessary to have Outlook environment in our system to run software properly? Yes, to run the software properly you need to have MS Outlook environment. Install the Microsoft Outlook on your machine of any version of Microsoft outlook with a valid/dummy profile. How much time this software takes to split a 40 GB PST file? Accurate execution is a guarantee of this software. It depends on the size of the file that how much time software takes to finish the task. Can I split my PST file according to size? PST Splitter split file as per the size you have decided for a file. By selecting this option you will be able to split large Outlook PST file and you can divide it simultaneously. After splitting MS Outlook 2007 PST file can I use it on outlook 2013? Of course, this splitter enables you to use split files on any version of Microsoft Outlook. This is really a capable tool to split large size PST files and save them from corruption. The tool worked smoothly and saved 500 of PST files from corruption. I have found the tool incredible and lifesaving for PST database. The software is simply affordable that can work with all Outlook versions without any harm to the programs of the system. The software is so easy to handle and can split various files with very fewer efforts taking few minutes. I would like to rate 5 stars to the tool. The software is capable to split Outlook PST files by various criteria and provide you the quality report after the conversion process. The software fairly split all contacts, emails, tasks etc. and makes the management of PST files easy.